With recent DEP policy changes, PRC is now able to accept televisions at all Hard-to-Recycle Collection Events beginning with the May 14th, 2016 Event. Find more information here. 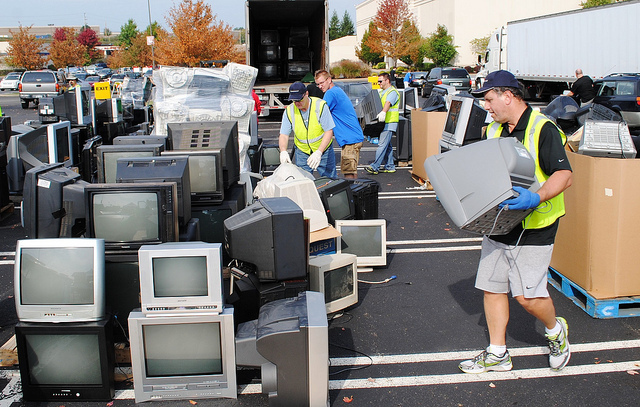 After a recent clarification by the DEP regarding Act 108, PRC will be able to collect televisions at all Hard to Recycle Collection Events beginning with the May 14th event for a fee. Please click here for more information about the recent update and the text below for more information about electronics recycling. TV makers assume a 5-to-7-year replacement cycle for televisions, according to the Consumer Technology Association. So if you don’t need to dispose of a TV this year, you’re bound to face the dilemma in the near future. In 2015, PRC collected 500,000 pounds of e-waste at 6 collection events – with TVs representing 74% of the 250 tons of material dropped off by 3,500 households. The volume of TVs dropped off at PRC e-waste collections has doubled in the past 2 years: 250 tons of e-waste collected in 2015 vs. 125 tons collected in 2013. During the first 11 years of PRC’s collection program, it collected a total of 1 million pounds of electronics – but it collected ½ million pounds in 2015 alone! While PA is 1 of 25 states with legislation to keep e-waste out of landfills, PA is 1 of only 5 states where the law has caused recyclers to bear the brunt of expense. Recyclers say the per-pound fees they receive from manufacturers to collect electronics on their behalf are flat and the prices of selling metals and other parts have declined. Televisions are more expensive to recycle because only a few companies worldwide take the glass from lead-based cathode-ray tubes in old models and computer monitors. 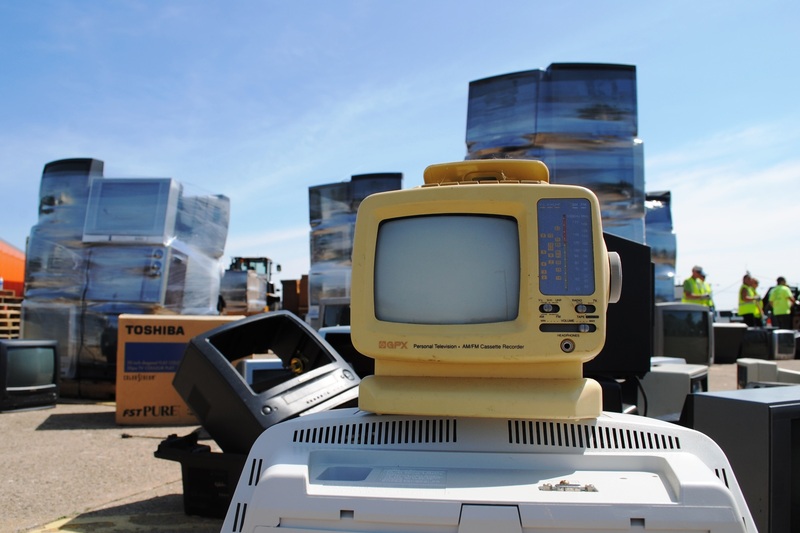 Estimates show 77 million CRT televisions are being stockpiled in U.S. homes, pointing to a need to responsibly recycle 269,000 tons of lead (average of 7 pounds of lead per TV). Act 108 required the manufacturers of TVs and computers to pay the costs of providing residents with free and convenient recycling alternatives. But the law has not led to the creation of a dependable, statewide infrastructure for local governments, collectors and recyclers to provide recycling services continually, according to a 2015 DEP report presented to the PA General Assembly. This failure is the direct result of manufacturers underfunding the cost of recycling. Best Buy, which began offering free electronics recycling in 2009, stopped taking TVs and computer monitors in Pennsylvania in February 2016. Construction Junction and Goodwill have suspended TV recycling, and of Allegheny County’s 130 municipalities, only 35 offer electronics recycling through their waste haulers. While most residents are seeking disposal options for TVs that are no longer in working condition, individuals must investigate limitations. In 5 southeastern PA counties, only 21% of manufacturer collection locations will accept non-working TVs with no restrictions. The electronics recycling industry has the potential to do great harm to public health and to the environment. Irresponsible recyclers have been caught shipping these hazardous materials to Third World nations that are unable to regulate their handling. As a result, rigorous third-party certification programs have been developed to ensure people and the environment are protected from these risks. PRC is committed to working only with recyclers who meet the strict requirements of the eStewards certification. While other certification standards exist, only eStewards ensures both people AND the environment are protected. Contact your state senator and representative asap to tell them to support an amendment to the law that ensures all residents of PA have convenient and free access to recycling their TVs. Given the 77 million CRT TVs that remain in American households, as much as 269,000 pounds of lead (a documented neurotoxin) is sitting right in our own homes! These numbers do not even include the materials from other electronics such as computers, printers, refrigerators, and more. If these electronics are improperly disposed of, these chemicals can leach into our groundwater, soil, and air, eventually making their ways back into our drinking water, lungs, and otherwise harming our families and our local environment. If these electronics are improperly recycled they may end up overseas where substandard working conditions lead to even greater environmental and health impacts. How Many TVs Are There? The Consumer Electronics Association estimated in 2014 that more than 77 million old style tube TV’s remain in American households waiting to be recycled or disposed of. TV makers assume a 5-to-7-year replacement cycle for televisions, according to the Consumer Technology Association., which means that the number of televisions in need of proper recycling and disposal is only going to increase in the coming years. Of almost 350 sites on the list less than 50 accept TV’s! At all of our Hard-to-Recycle Collection Events, PRC works with certified e-Stewards to ensure that our electronics are recycled responsibly. e-Stewards do not export electronics to developing nations, prohibit the disposal of e-waste into landfills and incinerators, tests for hazardous materials within the e-waste to protect their workers, and refuse to utilize prison labor to process hazardous e-waste. You can find more information about the e-Stewards Certification vs. other recycling options here. Over the past 12 years, 28 states and the District of Columbia have passed some sort of e-waste laws. These laws range in scope and depth, and some have enjoyed more success than others. Many states utilize landfill bans, which simply prohibit most e-waste from entering landfills and/or incinerators. Other states, like California, set up a system to fund recycling services for electronic items, allowing retailers to collect fees to pay for the recycling of items. Other states require television and computer monitor manufactures to divert those items from landfills and pay for their disposal. (Maine.) This type of system is known as extended producer responsibility (EPR), which Maryland, Washington, Michigan, and Hawaii have used as well. In Utah, manufacturers are responsible for educating consumers about where they can recycle unwanted electronics. Many of these states also prohibit certain chemicals from being included in electronic devices. Other states such as Texas, used a computer take-back program. and Wisconsin and Indiana set statewide recycling targets. It’s time to speak up regarding the need for convenient TV recycling options. PRC will continue to aggressively pursue a solution to this crisis by working with the PA legislature, manufacturers, recyclers, our partners and YOU! As supporters and users of PRC programs, your voice is critical in guaranteeing that we improve the CDRA to ensure that consumers have free and convenient access to safe and responsible outlets for their old electronics. Make your voice heard by calling, emailing or writing your state legislators to ask them to support an amendment to the CDRA that secures a permanent solution for the end of life management of old electronics, especially TVs. Use this link to find your legislator and find a sample message below to send to your State Senator and State Representative. As a resident of Pennsylvania, I am concerned about the lack of free and convenient recycling options for responsibly disposing of televisions and other e-waste. I ask the Pennsylvania Legislature to pass an amendment to Act 108 (Covered Device Recycling Act) to provide free e-waste recycling for all residents of the Commonwealth. Please support this vital piece of legislation.